These days, facilities managers are constantly balancing doing more with fewer resources. 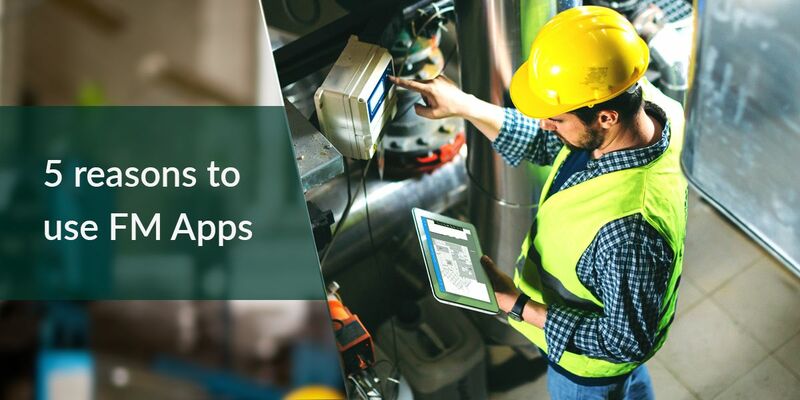 However, with the growing acceptance of using mobile devices and apps to manage facility maintenance, the ability to meet higher expectations for productivity with shrinking staff and budgets can now be met. In the last few years, using mobile devices for day-to-day activities in facilities has been gaining traction. This is due largely to the fact that, as a facility manager, you need to be able to effectively multitask on-the-fly to manage the growing workload, especially when out in the field. Using mobile devices with facility management software helps teams meet expectations and empowers them with the information they need in their pocket. Easy access to critical information and documentation is essential to reducing silos in facility maintenance. And, the ability to find that information fast in an emergency is crucial. Imagine your office has flooded due to a burst pipe. Knowing where the pipe’s shut off valve is located is key to avoiding a catastrophe. With the information safe in an app, you can search and find the shut-off with a few taps, text the closest person, and crisis is averted. By not having to search for the document in a room full of paper, you saved not only time, but money that won’t have to go to repairs. By keeping your critical facility information in a centralized document management solution, you have the power to instantly find information in all types of emergencies and keep damage to a minimum. One the biggest perks of going mobile is you can manage your facilities responsibilities and communicate with your team from anywhere on the campus or another location in real-time. Having the information at your fingertips saves you hours of searching through piles of documents or running across town or campus to find a certain document and gives you more time to complete your projects. In addition, your team automatically stays in sync, meaning everyone is on the same page. Even if you work offline, your files will sync once you’re connected. With an app, you can view a doc from anywhere, mark it up, share and everyone’s up-to-date with what must be done. Mobile facilities apps not only empower field personnel and technicians, they now allow tenants to put in repair requests directly in an app. This enables work tickets to reach facilities personnel faster. These maintenance requests can then be easily tracked by your tenants and closed upon issue resolution. Having a smart facility management solution in place, not only increases productivity of your facility personnel, so they can move on the next job, but also improves the tenant experience by getting quicker resolution to the issue. After all, a leaking pipe or a broken-down AC unit directly affects your tenant’s comfort and productivity. In addition, these apps can help you manage, schedule and budget for planned maintenance, eliminating problems before they become an issue for your tenant. It’s a daily challenge to maintain a balance between the comfort of tenants and the operating cost requirements of building owners. However, with IoT enabled devices you can easily track, locate and access assets such as HVAC, lighting, smart meters, security and alarms, smoke detectors, ventilators and more without needing to be physically present. It also gives you the big picture of how they are performing and working together. The IoT serves as a central network that not only provides data, but can alert you when a system isn’t operating properly and offers programmable or manual control over the assets, even allowing you to adjust on the fly, thereby improving the tenant experience and increasing efficiency. There is a tendency among facilities staff to hoard critical building knowledge, often simply committing it to memory. When the FM retires, or moves on, management is often clueless to where their facility information is located. One of the more impactful ways FM apps can improve your ability to perform your job is to become a repository for “tribal knowledge.” Facility document management software gives you a secure, accessible repository to transfer this specialized knowledge to, ensuring critical information learned over the years remains with your building. For most Facilities Managers time is a precious resource and you’re often pulled in several directions at once. By choosing the right facilities management app, you can more efficiently manage requests, save time and increase your productivity.